The fateful ‘Trafalgar Dawn’ appears to you as if you are a crew member standing on the ship’s belfry. “I was awakened by the cheers of the crew & their rushing on deck …” Lt. Barclay, HMS Britannia. Of the veteran’s ghosts – A Trafalgar Project Background Make what you will of this, for sure it has never happened before or since to Gordon. Several times during the painting’s creation, the Artist had the distinct impression his studio was visited by some of the veteran’s ghosts, come to see the progress & discuss with each other. When Gordon Frickers began to work on his series of paintings about Nelson & Trafalgar in 1995 he realised as he read more deeply, that the direct evidence of the enemy, much ignored & dismissed by British sources, was important. This unfashionable view he discovered was surprisingly shared by the Admiralty appointed Committee of 1913 who were set up especially to investigate what actually happened as opposed to the widely peddled myths. The more he read, the more Gordon Frickers came to realise there was a significant & valuable difference between the popular version of the battle & what actually occurred. The truth, depicted as accurately as the artist was able, is offered in Nelsonian spirit, “to my country and for the benefit of Europe in general” & turned out to be even more fascinating than the myth. 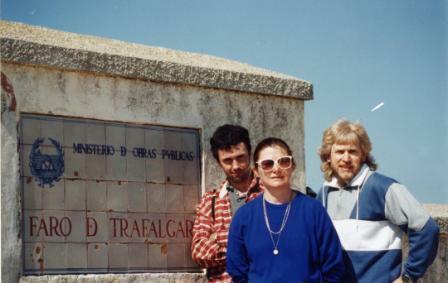 Gordon Frickers at his own expense travelled to Brest, Paris, London, Liverpool, Madrid, San Sebastian Naval base & Cadiz and visited Cape Trafalgar to study source material for his series of paintings. The smaller size is eminently collectible and very affordable. The larger size is simply stunning. Visit the Print Gallery (on the taskbar above) for current prices and the simple route to order. Printed to your individual order, should a misfortune befall the artist or his master printer, the full edition will not be published, thus increasing their rarity. This strictly numbered limited edition is offered in a choice of 2 sizes. Two sizes does not mean 2 sets of limited editions, for example there will only be one print number “72” regardless of the size ordered. We can only offer this choice because we are very fortunate to have found a dedicated and enthusiastic printer with the most modern equipment available. He and Gordon Frickers work closely, the proofing entails numerous visits by the artist to the printer and in this case the original was kindly loaned, just as well as a reshoot proved necessary. Very soon after this moment, according to the log of the Victory, as soon as the light permitted flags to be distinguished, Nelson made his first signal of the day. This signal, No 72 – general, (to all his fleet), was for the order of sailing in two columns; the British attack began. The basic scene is from studies made on-board the Victory. Gordon Frickers took full advantage of the privilege of unrestricted access to the ship, the full cooperation of her curator Peter Goodwin and her then Commander. At his own expense, with a letter of introduction from Victory’s commander, Gordon Frickers travelled to Brest, Paris, London, Liverpool, Madrid, San Sebastian Naval base, Cadiz and visited Cape Trafalgar to study source material. The principal sources studied by the artist were the logs, journals, official letters, period models, ships plans and maps known to have been compiled at the time by those present and the reports written after battle by the survivors, officers & men from both fleets. The evidence of the British logs and journals are indirectly confirmed by the diagrams drawn and reports written by the French & Spanish officers present at the battle. Allowance had to be made for the varied viewpoints of the officers in ships of the Combined Fleet. The order of the combined fleet was also described in detail by the Franco – Spanish officers, is reflected in our painting and confirmed for you in the margin of each limited edition print. It is possible to identify all the ships in the fleet including the signal frigates & corvettes. The artist still has his original notes and sketches, plus copies of many of these documents and others related for example the report of the 1913 Admiralty Committee. “I was awakened by the cheers of the crew & their rushing on deck …” Lt. Barclay. This excitement was repeated on most of the other British ships. The officers were expecting this dawn spectacle, the men were not, hence the reaction. The scene is based on eyewitness accounts from both fleets and sketches made by Gordon Frickers whilst on-board HMS Victory, which were later developed in his studio. Five minutes after the informal moment depicted, at 06.10, according to the log of the Victory, as soon as the light permitted flags to be distinguished, Nelson made his first signal of the day, No 72, general, (to all his fleet), for the order of sailing in two columns, the British attack began. The Admiralty appointed Committee of 1913 wrote; “The sun rose behind the Franco – Spanish fleet which, in the earlier hours of daylight, was in a very favourable position for observing the British. Several officers whose rank & quarters or station in their own ships gave them exceptional facilities for seeing the British fleet during those hours officially reported their belief that the British fleet was not in regular order when sighted. The evidence of the British logs & the French reports is indirectly confirmed by a great variety of diagrams drawn by the French & Spanish officers present at the battle”. The order of the combined fleet was also described in detail by the Franco – Spanish officers & reflected in our painting in which it is possible to identify all the ships in the fleet including the signal frigates & corvettes. HMS Victory is to this day still a Royal Navy flagship. The basic scene is from studies made on-board the “Victory”. Gordon Frickers was given unrestricted access to the ship by her Captain, and the cooperation of Peter Goodwin, Keeper and curator. Gordon took full advantage of the privilege, his name often appearing on daily orders. Gordon Frickers carried a letter of introduction from the then serving Captain of HMS Victory (Mike Cheshire) which undoubtedly helped him gain access to some very rare archives. in Europe including visiting Brest, the Paris archives and Musee Marin, Madrid museum maritime and archives, Cadiz and the Naval base at San Sebastian where he was the guest of the port Admiral and the curator of the Naval Museum. This was achieved with the help of representatives of the Plymouth twinning committee and the office des Jumalages de la Ville de Brest, in particular Professor Michel Malgon. As with all his Nelson and Trafalgar paintings he has read and studied much first hand material, journals, log books, officer’s sketches and reports, even 2 Spanish books entirely on the subject of the weather in October 1805! At San Sebastian in 1996, the curator in serious vein told Gordon Frickers the British accounts of the battle were wrong, propaganda, he said it was a great British secret, the reality being the Spanish destroyed 4 British ships of the line. This was not entirely surprising as a similar story appeared about 6 weeks after the battle, in Paris in the journal recognised as Napoleon’s mouth piece. Every last rope on Victory, you can even tell which were shroud laid, was checked by Peter Goodwin, Victory‘s Keeper and Curator. The fleet on the horizon is taken from sketches made by officers in both fleets present on the day so is about as accurate as one can get. The movements of the men, their positions, body language, age, the cut and fashions of their cloths & even hair styles result from very extensive research, as is the equipment, appearance & position of Victory & the other ships depicted. Even down to which way the rigging was laid on Victory. All is as historically accurate as the most though research could make it at the time. The original painting, sold in 1996 into a private collection for £4,000.00 was valued in October 2004 at £12,000.00 and again in October 2017 at £35,000. Consequently in common with all the paintings in this series, this is not only a fine picture but also an historical document, sound investment – very collectible! Pike racks approx 7′ long. Shrouds ½ diameter of mast divided by 3 = 5½ inches thick. Sail cloths, 2′, 1½ inch seams. Discussion about focsle, weather boarded or netted with hammocks. Progress book, 1801 – 1803 refit, Public records Office. Elderly officer – discussion on how old & how portly! The heart fitted at the end of the main stay near the fore mast was made of wood, at first it appeared metallic in the painting, and this was adjusted. Discussed at length the likely guns on the focsle, settled as most likely, carronade. Every detail was a subject for re-evaluation & detailed discussion between the Artist & many experts, in particular Peter Goodwin. This painting has been reproduced in Peter Goodwin’s book, “Nelson’s Ships“. Frequent visits to the ship HMS Victory. Service Historique de Marine, Chateau de Vincennes, Armees. The Trafalgar Campaign, The Naval Campaign of 1805, Vol 2, by Edouard Desbriere, Chef D’Escadron de Cavalerie Brevete Chef de la Section Historique de L’Etat – Major de l’Armee, translated by C Eastwick Oxford University Press 1933. Most accounts of the Battle of Trafalgar story vary and they are full of errors, the majority of plans and paintings are equally misleading..
Special thanks to the Plymouth Naval reference Library (very sadly now closed by Plymouth CC, a great loss) and to Plymouth twinning office and to the Office des Jumalages et Relations Internationales de la ville de Brest and the Naval attaché of the Spanish Embassy in Paris.